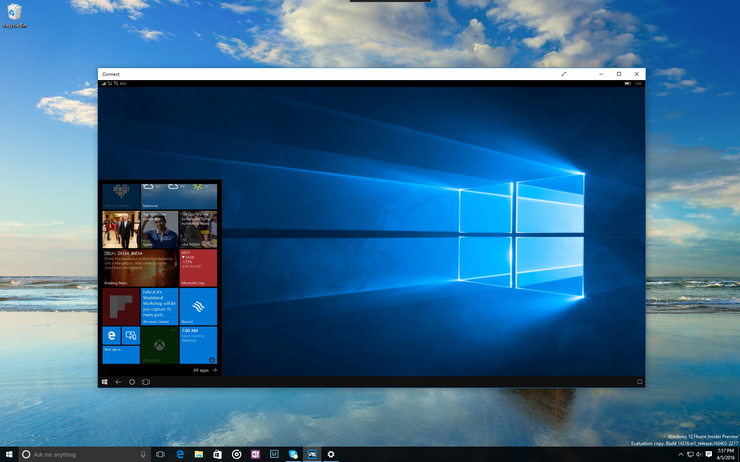 The new version of Windows 10 is a solid, if not dramatic, upgrade. Cortana haters, though, won't be happy. The Windows 10 Anniversary Update has been a year in the making, with more than two dozen public previews made available so that we could get a taste of what was to come. As of August 2nd, it is finally here. This new version will be delivered via Windows Update -- although at the time of writing, it was not yet clear whether it would be available immediately to everyone or whether there would be a slower rollout. So after all the time, all the work and all the hype, how does it stack up? Will it improve Microsoft's one-year-old operating system, or make users regret that they upgraded? I've installed it on a Microsoft Surface 2 tablet and HP Stream 13 laptop in order to take an in-depth look. Read on for details. Does Edge get an edge? Microsoft introduced Edge, the successor to Internet Explorer, when it released Windows 10 a year ago. The browser hasn't exactly caught fire since then: According to NetMarketShare, Edge's share of the browser market in June 2016 was under 5%. One reason might be that although Microsoft promised that Edge would support browser extensions, it hasn't yet done so. Until now, that is. With the Windows 10 Anniversary Update, Edge supports extensions. And does a nice job of it, with one very large caveat: There simply aren't many extensions yet, and not all of them work. Installing extensions is simple. When you're in Edge, click the menu button at the top right of the screen (it's three horizontal dots). From the menu that appears, choose Extensions > Get extensions from the Store. You'll see icons for each extension available. Click any icon for more details, then click the button that either says "Free" or lists the price to download it. After the download, click the "Turn it on" button that pops up to enable the extension. The extensions include one for clipping content to Evernote; one for letting you create and edit Office documents from within Edge; Microsoft Translator for translating web pages; OneNote Clipper for adding web content to OneNote; Mouse Gestures, which will allow you to use mouse movements for browsing; a Pin It button for adding web content to Pinterest; the Amazon Assistant for shopping on Amazon; and Reddit Enhancement Suite, which lets you subscribe to comment threads and more easily keep track of subreddits, among other things. 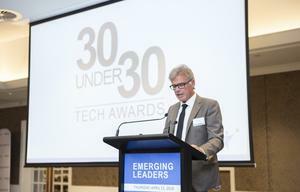 There are also several ad blockers; an extension that translates foreign-language web pages; and one that lets you use an online version of Microsoft Office from inside Edge. The Office extension integrates nicely with the client-based version of Office and with OneDrive. When you launch it, the extension displays the last seven documents you've worked on; you can click View more to see more. Click any document and you'll launch the file from cloud-based OneDrive and edit it using the same interface as Office 365. I tried a few others as well. Mouse Gestures worked as promised, allowing me to do things such as close tabs with a simple move of the mouse. But it only works with a mouse, not with a touchpad, which is problematic for people with laptops. On the other hand, Microsoft Translator performed well -- when I was on a foreign-language web page, a translate icon showed up at the right of the address bar; I just had to click it to translate the page. Clearly, Microsoft still has a long way to go when it comes to Edge extensions. Google Chrome has tens of thousands of extensions; it's not likely that anyone will abandon Chrome for Edge so they can use the 13 extensions currently in the Microsoft Store. 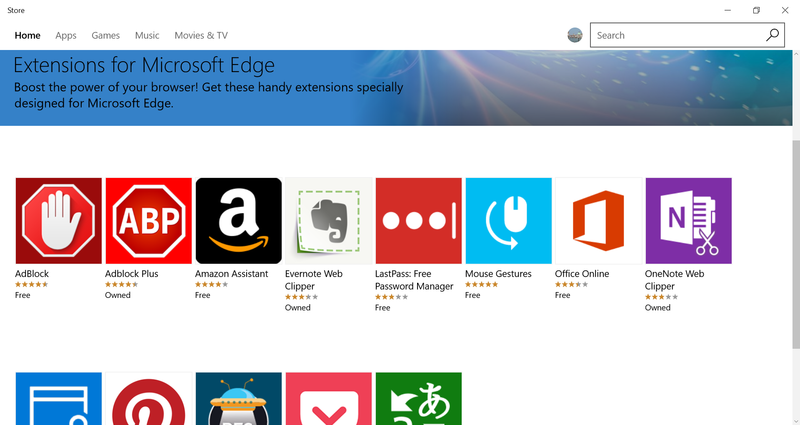 Microsoft Edge finally can use extensions --- but not a lot are available yet. People who hate Adobe Flash ads will welcome the new Edge, though. Edge now determines whether Flash content is integral to the page you're on and auto-pauses any non-essential Flash content (such as ads). Any Flash content that is important to the page, such as news videos, won't be auto-paused. Want to see that ad after all? You'll be able to manually play the content if you want. All this does more than just stop an annoyance. Flash also eats up battery life, so auto-pausing Flash ads should help laptops last longer when running on battery. And it will help pages load more quickly and be more responsive as well. In my tests, I found that Flash-blocking worked well. Edge successfully auto-paused every ad on a page full of sample flash ads. Clicking the play button on each played the ad. Keep in mind, though, that this won't block every Flash ad. Many sites automatically play videos as an integral part of their core content -- and often an ad plays before the content does. Edge doesn't block those ads. Microsoft claims the browser now uses fewer CPU cycles and less memory than before, for faster browsing. The browser supports swipe gestures so that you can navigate between web pages by swiping forward or back. If you right-click the Back button on the upper right of Edge you'll see a history menu, so that you can quickly go back to any page you've visited. Edge has added support for web notifications, so that sites can send you notifications that appear in the lower-right corner of Edge and also appear in the Action Center. Edge has clearly been improved in this update. But a lack of extensions means that it will remain an also-ran to better browsers, notably Chrome. I, for one, won't be abandoning Chrome for Edge. 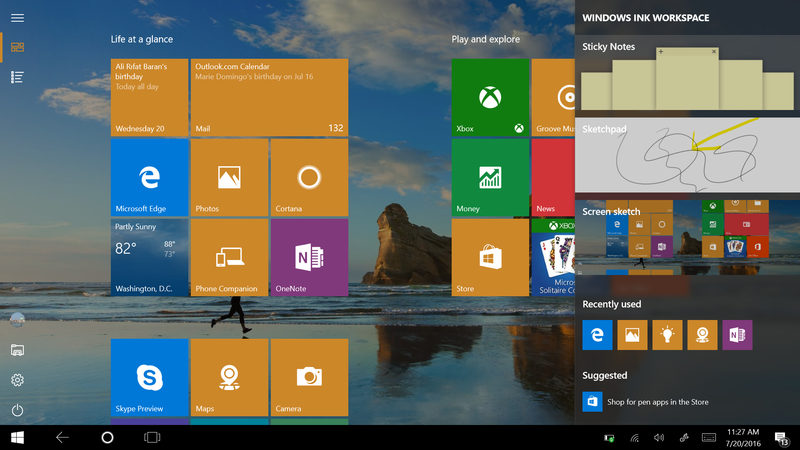 Perhaps the most-lauded change to Windows 10 was bringing back the Start menu. Microsoft obviously isn't done with its work on the menu, because the Windows 10 Anniversary Update includes a host of helpful little tweaks. Nothing revolutionary, but there are some nice improvements. Probably the best change is that the All Apps list appears when you click the Start button, so that you immediately see an alphabetical, scrollable list of all the apps and desktop applications on your PC. Before this, you had to first click the Start button, then click All Apps. Saving a single click might not sound that important, but until this update, I rarely found myself using All Apps. Now I use it all the time. The Start menu now displays all of your apps in alphabetical order. The Start menu has other improvements as well. Links to Power, File Explorer, Settings and your Microsoft account have been moved to a narrow list on the left side of the Start Menu, so they're always visible when the Start Menu is. The Start Menu has also been changed in tablet mode. You're no longer tied to an interface that only shows pinned tiles -- you can now have a full-screen All Apps view that lets you scroll through all of your apps and desktop applications more quickly to find one you want. Also, there are now permanent links to Power, File Explorer, Settings and your Microsoft account on the left side of the screen in tablet mode just as in desktop mode. You can now have an All Apps view on tablets. You can also auto-hide the taskbar when you're in in tablet mode, even if you hadn't hidden it in desktop mode. (Before the Windows 10 Anniversary Update, if you hid it in one, it was automatically hidden in the other.) To auto-hide it in tablet mode, go to Settings > System > Tablet Mode and switch on the setting "Automatically hide the taskbar in tablet mode." 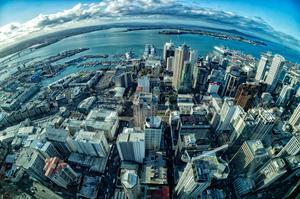 All this is nice, if not particularly revolutionary. Cortana has also been improved. It now lets you use natural-language requests to perform tasks such as sending email, which I found generally useful. However, although Cortana might be smarter than it used to be, it's still no Einstein. For example, the first time I said, "Send an email to Lydia Gralla," it did a fine job, finding Lydia's several email addresses, asking which one I wanted to use, and then letting me fill out a form onscreen to create and send the email without having to go into a mail app. It was particularly impressive because I didn't have Lydia's address in my Outlook account. Instead, it was in my Gmail account, and because I had linked that account to the Windows 10 Mail app, Cortana found the email address in Gmail. Cortana can now use its intelligence to send emails when you speak to it. According to Microsoft, Cortana now integrates better across multiple devices, including Android and Windows phones (although not iPhones). Ask for directions on your computer, and the directions will be sent to your phones as well. You'll also be able to find a lost phone from your computer via geolocation. Cortana is also now available from the lock screen, so you won't need to log in to your account in order to use it. Click in the Search bar, click the gear icon on the left side of the Cortana panel that appears (it controls Cortana's settings) and move the slider from Off to On under "Lock screen options." In addition, Cortana can now search through your OneDrive files, not just the ones on your local machine. I found all this nice to have, and it makes Cortana marginally more useful than previously. But if you didn't use Cortana before, nothing here will make you want to use it now. There's one change to Cortana that a lot of people might not like: You can't remove it or turn it off. Before this update you could go to Cortana's settings and move the slider from On to Off. No longer. Now Cortana is always on. However, you can limit what the digital assistant knows about you. Click in the Cortana search bar, then click the Settings icon (it looks like a cog) on the left side of the pane that appears. Turn off what you see there, such as your search history, device history and so on. One of the few truly new features in the update is Windows Ink, which lets you use a stylus to write on touch devices. Windows Ink makes it easy to use a stylus to write on touch devices. Tap or click the pen icon in the taskbar. The Windows Ink Workspace appears on the right side of the screen, with three available apps: a sketching app called Sketchpad, a sticky note app called Sticky Notes and an app for annotating screenshots called Screen Sketch. All three apps are serviceable, but none is particularly groundbreaking. As someone who is incapable of drawing a straight line, though, I found the ruler features of Sketchpad quite useful, because it lets you use a virtual ruler with a stylus to draw a straight line the way you can with a real-world pencil and ruler. The Windows Ink Workspace also displays the icons of other apps that work with Windows Ink, such as OneNote. Tap any icon to launch the app. The Action Center, which displays notifications in a pop-up panel on the right side, gets a few tweaks as well. You won't find anything dramatic, and if you're not a fan of the Action Center, nothing here will make you want to use it. I rarely use it, and I found nothing in this new release to change that. For example, you can now set priorities for which apps are more important than others and have their notifications show up at the top of your notification lists. Go to Settings > System > Notifications & actions, then scroll down to the "Get notifications from these senders" section and click an app. At the bottom of the screen you'll see settings for three levels: Normal, High and Top, with Normal being the lowest priority and Top the highest. Choose the one you want. You can now customize the priority of notifications in the Action Center. 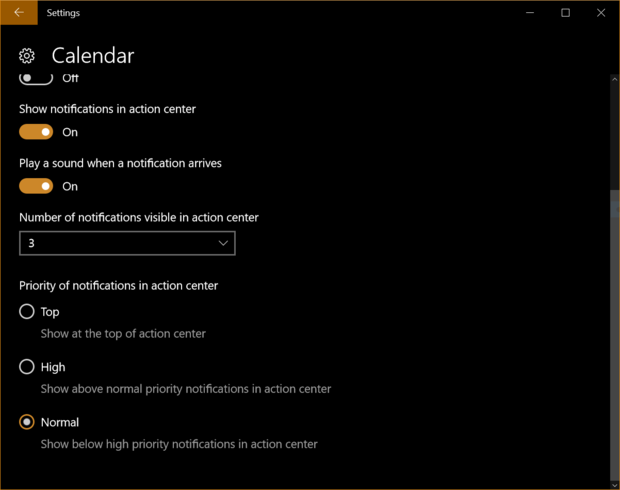 You can also adjust how many notifications can be visible at any time in the Action Center for any app. The default is three. To change it, click "Number of notifications visible in action center," and select a number from the drop-down list (you can choose one, three, five, 10 or 20). The Action Center icon on the taskbar has been moved to the far right to make it easier to see. It now displays the number of notifications you have. And the actual notifications displayed in the Action Center can now show content grabbed from the app's live tile, making them a bit more useful than previously. You can also change the location of the Quick Action buttons in the Action Center, although you can't change it from directly inside the Action Center. Instead, you have to go to Settings > System > Notifications & actions, and in the Quick Action section, drag and drop any icon to where you want it. People who are concerned about personal security will be pleased at something Microsoft has removed from Windows 10: A controversial aspect of its Wi-Fi Sense feature that was designed to automatically connect guests to Wi-Fi networks without their having to type in passwords. When Windows 10 was first released a year ago, people worried that it invaded their privacy by sharing all their Wi-Fi passwords with their Outlook and Skype contacts, and with their Facebook friends -- as well as all of their friends' friends. If they looked at the way it actually worked, they would have seen it wasn't a big privacy invader because the passwords wouldn't be visible to anyone. In addition, users controlled whether to use the feature and would have to manually turn on sharing for each one of their Wi-Fi networks. But Microsoft was stung by the criticism -- in a blog post, a company representative writes, "The cost of updating the code to keep this feature working combined with low usage and low demand made this not worth further investment." What Microsoft didn't say was that doing away with it would be good public relations for the company as well. The feature hasn't been completely killed, though -- only the controversial part of it that has to do with you sharing your Wi-Fi networks with others. So in the Anniversary Update, the same blog explains, "Wi-Fi Sense, if enabled, will continue to get you connected to open Wi-Fi hotspots that it knows about through crowdsourcing." That means if you're near a publicly open Wi-Fi hotspot, you'll be automatically logged in. 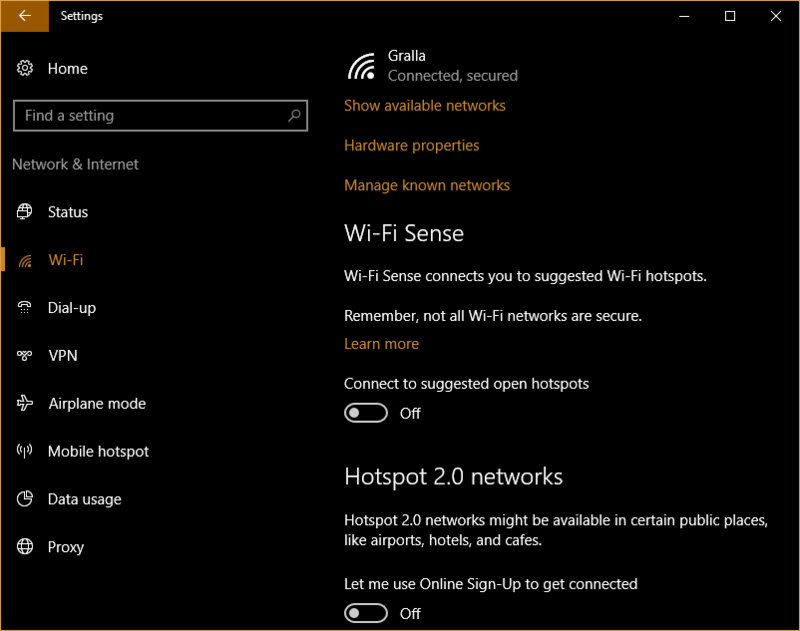 The Windows 10 Anniversary Update eliminates the more controversial features in Wi-Fi Sense. This feature is enabled by default. 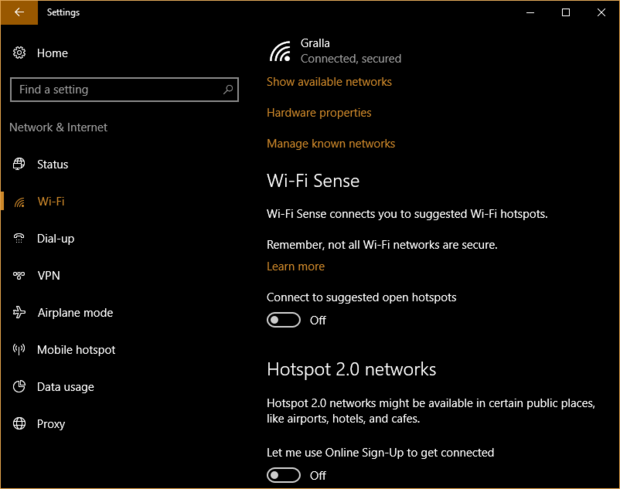 If you want to turn it off, go to Settings > Network & Internet > Wi-Fi, then scrolling to the Wi-Fi Sense section. Underneath "Connect to suggested open hotspots," turn the setting to Off. The update has a gift for developers who use both Windows and Linux: a built-in Linux command line consisting of a GNU Bash shell. It's the real thing -- a full-blown Ubuntu command line created in partnership with Canonical. Bash is a tool for developers -- not a server platform for running websites or server infrastructure. So while most users won't care much about this, many developers will greet it with open arms. The Linux command line isn't turned on by default -- and if you want to turn it on, you're going to have to do some work. To do it, go to Settings > Update & security > For developers, and choose Developer mode. You'll then have to wait for the "Developer mode package" to download (which took me less than a minute). Once it's downloaded, you'll get a notification that you need to restart your PC. After it restarts, go to Control Panel > Programs > Turn Windows features on or off. Check the box next to Windows Subsystem for Linux and restart your PC. Then type Bash into the search box next to the Start button and press Enter. You'll see a command line. Type Y and press Enter to continue with the installation, which downloads the Bash on Ubuntu app from the Windows Store. 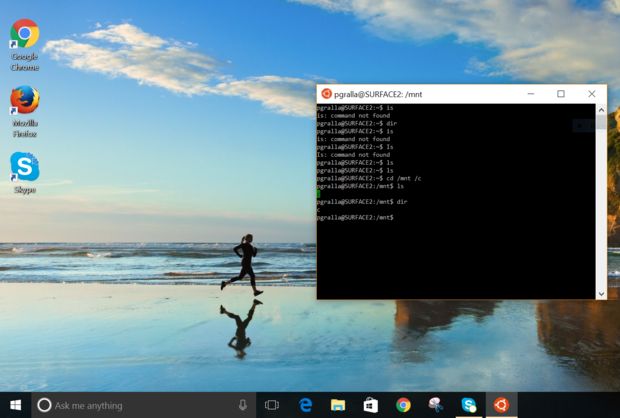 You can now run a Linux Bash shell inside Windows 10. After it downloads and installs, you'll have to create a user account and password. At that point, you can run the Bash shell and the app will show up on the Windows 10 All Apps list. In the Anniversary Edition, you can paint Windows black -- so to speak. The OS will now include a dark theme. 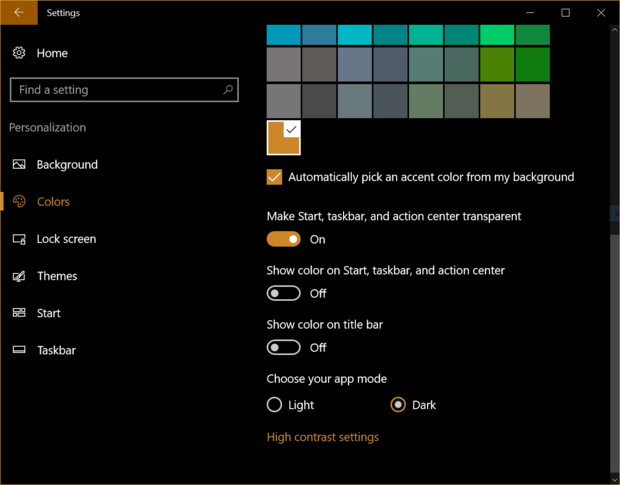 But don't be surprised if that dark theme turns light again inside apps, because some third-party Windows apps control their own theme settings rather than relying on Windows to do it. Windows 10 now has a dark theme. If you're in a dark mood, go to Settings > Personalization > Colors, scroll down to "Choose your app mode," and select Dark. Microsoft's fingerprint sensor technology (called Windows Hello) can now be used not just to log into Windows itself, but also in Windows apps and websites -- just as long as those apps and sites use the technology, and you have hardware that supports it. You can control your power use better by deciding which apps should be allowed to run in the background; you can also let Windows decide based on how the operating system determines how each app will affect battery life. Just go to Settings > System > Battery > Battery usage by app and click any app. You can choose whether to always let it run in the background, never let it run in the background or let Windows decide. The Calendar app now integrates with the Notification area. So if you click the day and time, the calendar pops up as a sidebar that lists appointments, notes and reminders. Click any other day in the sidebar to see appointments, notes and reminders for that day as well. There's nothing dramatic or groundbreaking in the Windows 10 Anniversary Update. 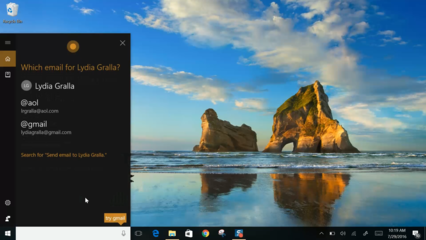 Cortana is moderately more useful, the Start Menu has gotten a few useful tweaks, the Action Center is marginally better and the Edge browser finally gets extensions (although there are so few of them, it doesn't make much of a difference). 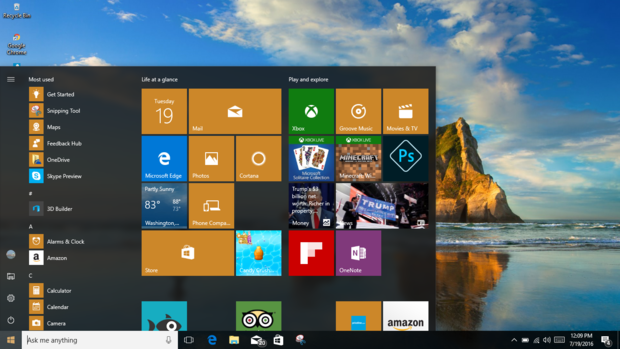 If someone doesn't like Windows 10, nothing in the update will change that. 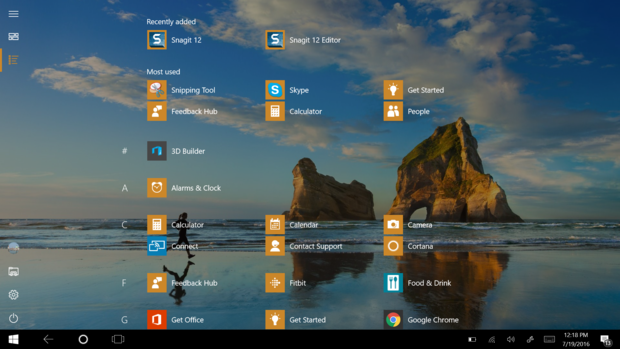 As for people who already use Windows 10, many users may not notice much of a difference aside from the Start Menu tweaks -- and even then, it won't much change the way they use the operating system. Still, it's a solid update. And anyway, who said a first anniversary is really much of a cause for celebration? After all, the traditional first-year anniversary gift is not silver, not gold and not diamonds. It's paper. So consider this update a thank-you note from Microsoft, one that you might not even notice.